Heated Pools – Enjoy a refreshing swim any season. Our outdoor pool is heated throughout the winter for your comfort. Participate in enjoyable pool events and activities, or just sink into patio furniture on the expansive pool deck to catch some rays (sunscreen recommended). Spas – Unwind and relax in one of our soothing and therapeutic spa. Clubhouses – Come join in the fun with your friends and neighbors. There is always something going on in one of the two clubhouses. Be sure to check Community News for clubhouse events. Free WiFi is available in the clubhouse and pool areas. Clubhouse can be reserved by residents for special occasions. 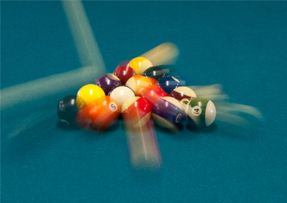 Billiar ds – Full size tables and quality equipment are available for your use. Strike up a match with friends or participate in tournament event. Game Room/Area – Friends, family, and neighbors of all ages can enjoy the challenge of a little friendly competition. We have foosball, snooker, card tableair hockey, video games and ping pong for your enjoyment (game availability subject to change).